Lichtsinn RV is America's closest RV dealer to Winnebago Industries, located just one mile north of the Winnebago and Winnebago Touring Coach factory in Forest City, Iowa. We proudly sell New RVs manufactured by Winnebago Industries as well as Used RVs. Lichtsinn RV sells the entire Winnebago Motorized lineup including the Winnebago Touring Coach Line made up of: the Winnebago Travato, the Winnebago Era, the Winnebago Revel, and the Winnebago Boldt - Class B motor homes. Lichtsinn RV is also one of the few Iowa RV Dealers that offers top brand-name RVs like Winnebago as RV Rentals. We have been named by Winnebago Industries as the Top North American Winnebago Dealer for the past 4 Consecutive Years, 2015, 2016, 2017, and 2018. Being the closest dealer to the Winnebago factory affords us the opportunity to provide you with speedy delivery of parts from our warehouse and Winnebago. We offer Winnebago, Itasca, Winnebago Touring Coach and Workhorse parts at competitive discounts and we offer fair shipping quotes, and you can avoid sales tax on out-of-state shipments! We have RVIA-certified technicians to service your motor home, travel trailer or fifth wheel. Our Winnebago Flying W customer satisfaction index scores rank in the best of class for Winnebago dealers! See our interactive map of Lichtsinn RV Motor Home Owners from around the world! 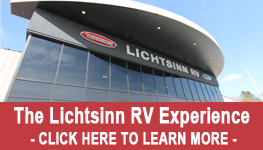 Why Buy from Lichtsinn RV? #1 Dealer of Winnebago Motor Homes in North America for the past 4 consecutive years. Only 1 mile from the Winnebago Factory in Forest City, Iowa. No Delivery Driver Fees or anyone Eating, Drinking or Living in your New Investment. 3-Year/100,000 Mile Diesel Pusher Warranty. 1/2 Day Orientation Including on Any RV Purchase. Competitive Financing with National Lenders and No Hassle Pricing. Family-owned and operated for over 40 years. Proud to contribute over $20,000 annually to local schools and charitable organizations including: The Local Schools, Hospice of North Iowa, the American Cancer Society and the Rotary Club. We make your out of state purchase easy! FIND OUT HOW - Click here!